(UPM, Helsinki, 12 January 2018 at 11:00 EET) - UPM has been recognised as a Water Efficiency Frontrunner in Jiangsu Province and China at large. As a frontrunner, UPM will serve as a benchmark for the industry and lead the promotion of water efficiency in China. In total, 11 companies received the highest recognition nationwide. UPM is the first, and only, company to obtain the highest recognition in Jiangsu Province. "Located next to Shanghai, Jiangsu is an important industrial base; with an economy of 7.6 trillion Chinese Yuan (EUR 972 billion) the province has second highest GDP in China, right after Guangdong. Jiangsu also has the strictest water and air emission permit limits in China", says Lisheng Jin, Environmental Manager, UPM Changshu Mill. "When putting this recognition in this context, we can be extremely proud of our achievement," he continues. The initiative was launched by the Ministry of Industry and Information Technology (MIIT) and the Ministry of Water Resources (MWR), together with the National Development and Reform Commission (NDRC) and the General Administration of Quality Supervision, Inspection and Quarantine (GAQSIQ) in 2016. The qualification process for the Water Efficiency Frontrunner was very stringent. UPM was commended for its systematic water management system, accurate and reliable control systems and long-term investments in several technologies and processes that have significantly improved water efficiency at the mill. 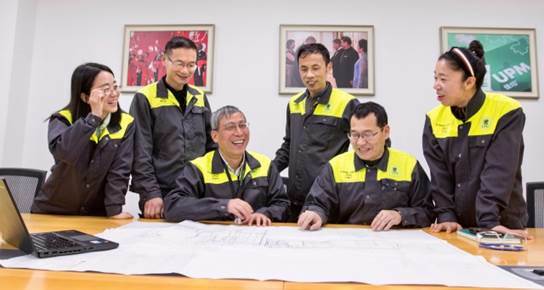 "Over the past 10 years we have reduced water consumption at the Changshu mill by 60% per ton of paper produced. While many small improvements have contributed to this achievement, we made major progress with the renewal of the waste water treatment plant in 2015. With the "More with Biofore in China" programme our ultimate goal is to eliminate the direct waste water discharge from the Changshu Mill," Lisheng Jin stresses.